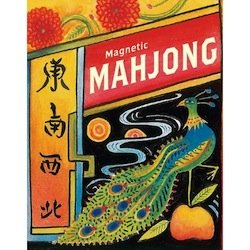 The ancient Chinese tile-matching game comes alive with magnets! For thousands of years, this simple, meditative game has kept traditions alive with a long history in fortune-telling and Asian lore. Play with 144 tiles imprinted with dragons, flowers, the four seasons, and the four winds: match up like tiles and remove them to gain points. This kit is made for traveling and playing solo, wherever your fancy strikes.